The new Stauff Connect tube connector range ... high quality. Stauff, a leading German manufacturer of pipe components and hydraulic accessories, will be introducing products from its Stauff Connect range at Adipec 2015 (Abu Dhabi International Petroleum Exhibition and Conference), which will be held next month (November 9 to 12) in Abu Dhabi, UAE. 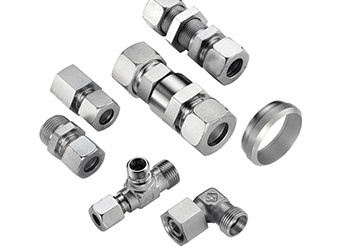 Stauff Connect – its own tube connector system for hydraulic systems – is a comprehensive tube connector range made of steel, consisting of 24-degree cutting ring connectors, connectors with 24-degree sealing cones and O-ring, 24-degree welding cones and 37-degree flare fittings. It has been designed for the safe and leak-free connection of metric tubes with diameters of 4 to 42 mm. The range is completed by check and shuttle valves, threaded reducers, fastening components and other accessories. Corresponding mounting tools and machines are also available. “With Stauff Connect, we offer our customers DIN steel connectors with the same high requirements for quality and service that we apply to all our products and that we have been known for in the market for many years,” says Joerg Deutz, CEO of the Stauff Group. With 800 bar for selected types and sizes, the pressure resistance of the fittings clearly exceeds the requirements of DIN 2353 and ISO 8434-1, says a spokesman for Stauff. All components and the corresponding production drawings were designed by the Stauff research and development specialists, and the products are tested thoroughly and consistently developed further at its in-house technology centre, he concludes. Stauff Group is known the world over primarily as a market and quality leader for clamps for fixing industrial tubes and hoses.